Back problems and the causes of back pain are related to the aging process, but that doesn’t mean you have to suffer from them. If you understand some key strategies to maintaining your spine health you can avoid back problems, and remain active and pain free. 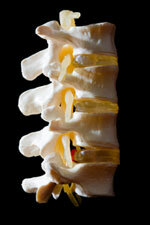 The structures of your spine will degenerate to some degree as all body tissues do with age. There are however a number of simple strategies you can use to counter these changes and prevent the causes of back pain. This page is NOT a comprehensive article on back pain, rather I want to point out what you should be doing to maintain your spine health and prevent back problems. 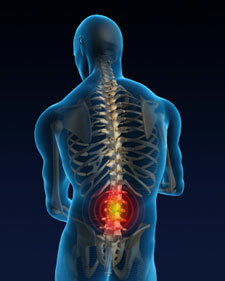 Serious problems with the back and spine need to be evaluated and treated by an orthopedic specialist. Your antiaging physician can direct you toward the right practitioner if you have critical back issues. All of these conditions are related and are caused by changes in the tissues that make up your spine and the muscles that support your spine and maintain your posture. Rather than address each of them separately, I will outline a general strategy to ensure your spine health, and prevent back problems from developing and limiting your enjoyment of life. Your spinal column is a junction of nerves connecting your body and brain. When these nerves become pinched, trapped, or otherwise irritated by tissues in your back, you experience back pain, from mild to severe. This interference with nerves can result in varying levels of back problems, including pain, numbness, or even partial paralysis if they become entrapped. This can really prevent you from enjoying a full and active life, and so you need to take steps to prevent this from happening. Spinal stenosis, which is a narrowing of the spaces through which the nerves pass. Degeneration of the cartilage in the disks of your vertebrae which normally cushion the spaces between the disks and prevent bone to bone contact. Remember that as you age some degree of degeneration is inevitable, but more severe degeneration can be prevented and back problems avoided by promoting spine health. Now that you know some of the basic causes of back pain, let’s go over some strategies to prevent these problems. Proper nutrition is essential for the health of your back and spine. This involves getting the proper amounts and balance of essential minerals to allow your body to build and maintain bone tissue, such as calcium, magnesium, and phosphorus. Getting the proper balance and form of minerals for bone health is not easy. In general you should have mineral testing done to determine what you are deficient in, eat foods that supply these minerals, and use a supplement that helps ensure you get enough. Vitamins such as vitamin-c and especially vitamin-d are important nutrients for the health of your bones, and spine. All of these nutrients work synergistically to create optimal spine health and prevent degeneration. The Life Extension Foundation makes a good supplement for this purpose called Bone Restore. Life Extension is known industry wide for top quality pharmaceutical grade products. Preventing back problems and the causes of back pain also involve avoiding or at least limiting things, which have a negative impact on your back health such as caffeine, alcohol, and soda. It’s interesting to note that all three of these substances are acidic in nature, and thus your body will try to counteract this acidity. It does so by using calcium to buffer this acidity, and it gets the calcium from your bones, which causes you to lose bone density. Strive to maintain a slightly alkaline environment in your body by limiting acidic foods. My page on the acid-alkaline diet has more information on this topic and its importance for your overall health. In light of the diuretic effects of certain foods, drinking enough water for hydrating your body, and in particular your spinal disks is very important. The disks take in water to keep lubricated and allow the cartilage in them to keep its cushioning properties. This process is called “imbibing” and it is vitally important for preventing the disk degeneration that can cause severe back problems, causing your spine health to deteriorate. The optimal hormonal balance also has an effect on preventing deterioration of your bones and spine. An antiaging doctor can evaluate your hormonal status and administer bioidentical hormone therapy to correct deficiencies. Exercise to keep all of the core muscles that help maintain posture and support the back is another key strategy. Strength training is particularly important for this because the loading and mechanical stress when lifting weights helps prevent osteoporosis. Stretching especially for the back and lower body is important for flexibility which allows you to maintain normal posture and spinal alignment, and prevent the bad posture that tends to occur with age, and is one of the most significant causes of back pain. (how you walk) and can evaluate and recommend orthopedic devices like orthodics, which can correct postural issues that lead to back problems. These steps may seem complicated, but the idea is to seamlessly weave them into your daily life and habits, so that you don’t have to think about them. Once you understand these concepts they get simple……really simple, and easy to do. Back problems don’t have to be part of your future. Take these simple and basics steps to address the causes of back pain and maintain your spine health. Using these strategies will allow you to remain healthy and active for as long as you live!